Around this time of year, we tend to turn to hot drinks like coffee, tea and hot chocolate to stay warm. While these delicious caffeinated drinks can give you an extra energy boost on these shorter days -- and a warm feeling in your belly -- they can also wreak havoc on your pearly whites! And don't fool yourself into thinking that adding cream or milk to your coffee or tea will stain them any less! 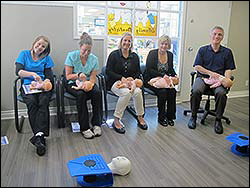 On Wednesday September 18th, Dr. Benedict, Dr. Liz and the team completed their yearly renewal of their CPR training. Instructor/fireman Mike from Rescue 7 was awesome and got the team all “fired” up to be top rate first aiders. Click here for more photos from our training session. Todd (Co-chair) of the Northumberland Sports Council. Since 2007, Dr. Benedict has been a dedicated supporter of KidSport Northumberland – a local agency that helps keep youth physically active by providing funding for organized sports. 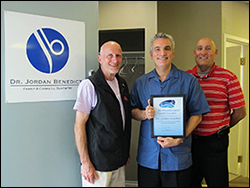 On September 26th, 2013, Dr. Benedict was honoured by the Northumberland Sports Council with an appreciation award for his continuing support. 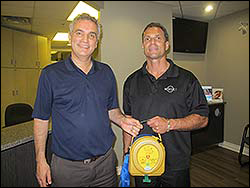 Way to go Dr. B – your team is very proud of your hard work! We are pleased to be collecting non-perishable foods, canned goods, and unopened toys between October 1st and December 13th, 2013. 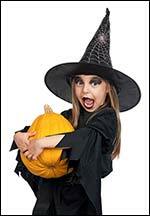 With Halloween being around the corner, our Hygienists - Laura and Hayley - would like to give out a few tips about how to help your kids to make the right choices for candies and snacks. When allowing kids to have their Halloween candy, it is best to let them have 2 small chocolate bars at once, compared to a bunch over the course of the day. This will limit the amount of sugar that will stay on their teeth throughout the day. Also, when choosing their treats, try to avoid sugary, chewy snacks such as licorice, jujubes, raisins and taffy as these treats can stick to teeth and cause cavities. Remember to keep your regular dental hygiene appointments and brush and floss daily. ...Even Pumpkin Donuts at Timmies! It is Halloween season, and that means you're likely bombarded with tons and tons of pumpkin-related recipes and specials. Well, we decided to resist the urge to share yet another pumpkin recipe. We're sure you have plenty of those. Instead, we have decided to share a unique, tasty, and warm meal that is great for a snack on a crisp afternoon or as part of a hearty breakfast to get your day started off well. While this meal is vegan, there are certainly no compromises in this delicious recipe! Click here for a recipe to get you started!